Life on Mars, or not? 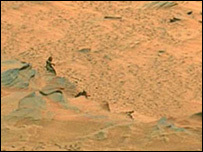 I’ve been watching the television news and have seen that our networks have picked up on a photo taken by the Nasa spacecraft Spirit in Jan. 2004, of a shape that looks like a human, or ‘bigfoot’, figure. I am an astronomer, writer, and skeptic. I likes reality the way it is, and I aims to keep it that way. My real name is Phil Plait, and I run the Bad Astronomy website. The zoomed-in view of the image on the Internet also makes it very difficult to see that Bigfoot is really not very big. There’s a neat tool that another rover fan, “Algorimancer,” has written that allows you to use the rovers’ binocular vision to estimate the distance to and size of objects visible in their images. Using AlgorimancerPG, you can determine that our little “Bigfoot” is actually less than five meters from the rover, so can be no more than about 6 centimeters tall. These are the types of things I enjoy about the immediacy of the Web. The ability to search for the guts of a story that our media has picked up. These are the type of skills we need to be teaching our students today. Previous PostPrevious Toonlet – creativity for your classroom on what has been a sad day.